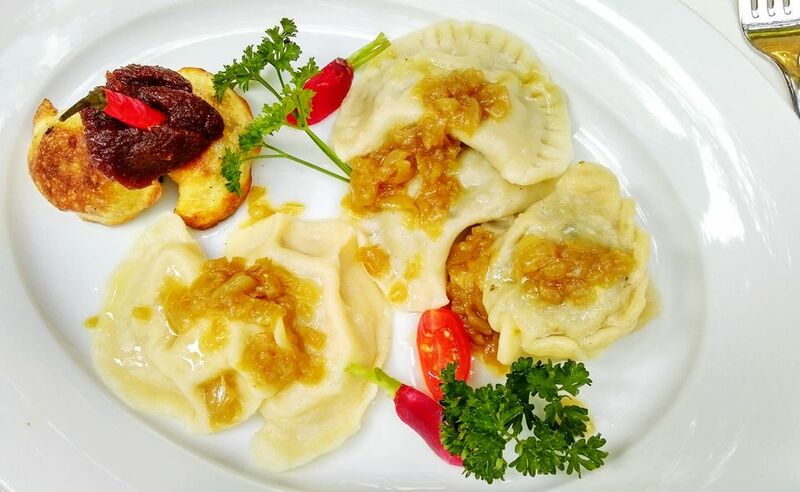 This recipe for Polish potato dumplings or pyzy uses a combination of raw, grated potatoes, and cooked, mashed potatoes in the dough, as compared to kopytka, which is made with cooked, mashed potatoes. Compare this recipe to Lithuanian zeppelin or cepelinai dough. Cut half the potatoes (leaving the other half whole and uncooked) into chunks and cook them in boiling, salted water until tender. Drain and mash or grind through a food mill and place in a large bowl. Meanwhile, grate the whole potatoes by hand or in a food processor using a very fine grater (you don't want shreds). Drain grated potatoes and place them in a linen towel or several layers of cheesecloth and twist and squeeze the cloth over a bowl to drain all the water out of the potatoes. Save the potato starch that settles to the bottom of the bowl (but not the water) and place it with the squeezed-out potatoes in the bowl with the mashed potatoes. Add eggs, salt, and both flours, and mix thoroughly, adding enough flour so ​​the mixture will hold its shape when rolled. Using slightly dampened OR floured hands, roll spoonfuls of the dough into balls. Bring a large saucepan of salted water to a boil and drop in the dumplings. Cook 4 to 5 minutes or until dumplings float to the top. Taste test for doneness. Remove dumplings with a slotted spoon to a colander to drain. Meanwhile, fry the slab bacon or sliced bacon until golden brown. Transfer the cooked dumplings to a serving plate and spoon over the bacon and drippings. Note: If desired, finely chopped onions can be fried together with the bacon for an extra layer of flavor.